What happens on an adventure cruise? UnCruise's ships are small (about 70 passengers and 22 crew members), and therefore able to maneuver into tiny coves and passages. The captain and crew have a loose idea of where they want to go, presented to us as "a plan from which to deviate." But if the weather is better for whale watching in one area, they improvise. 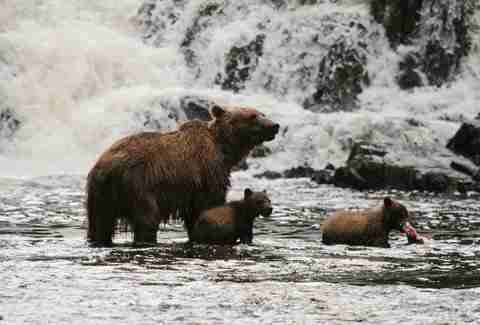 If we want to spend a little longer looking at a family of bears on the shoreline, they've got nowhere to be. Each day has a morning and an afternoon activity block in which guests can do any number of things: hike, kayak, snorkel, take a skiff ride. When not adventuring, guests can relax in the hot tub on the bow, get a drink in the bar (or in said hot tub), or read in the lounge. But that's about it. The food is good and the ship is comfortable, but it's designed so you spend time OFF the ship. "You are a guest in nature's house"
The areas we cruised through were remote and narrow, places that don't usually see many humans. So the animals we encountered had one of two reactions to us: intense curiosity or dismissing us as inedible and therefore pointless. The first night we pulled up to a rock topped with Steller sea lions. They all kind of looked over at us with expressions like, "You coming through here? Cool. Don't drink the good beer." Then went back to doing whatever it is Steller sea lions do. Another night we had a campfire on the beach. A small family of bears decided they'd like to join us for some s'mores and "Kumbaya." They moseyed over to our fire pit, unfazed by our guides' blasting airhorns, and peered in like that kid who wasn't invited to the party. Before they got close enough to be a threat, the tide came up and doused our fire -- nature letting us know, "You don't have to go home, but you can't stay here." The guides on this trip aren't off-season scuba instructors or listless kids looking for summer jobs. Many of them have advanced degrees in some sort of natural science. But rather than teaching Geology 101 to apathetic 18-year-olds, they've opted to spend their time educating people who've paid $5,000 for a week of their expertise. So when we passed a pod of orcas at sunset on our third night, we didn't just get an announcement to come and look at them. We learned about transient and resident orcas, and why they travel as they do. When we climbed up to the El Capitan cave, we learned the geologic history of the islands, and how we could tell old growth from new-growth forest. Our lone shore stop on the adventure cruise was to Kake, a Tlingit village of about 600 people. 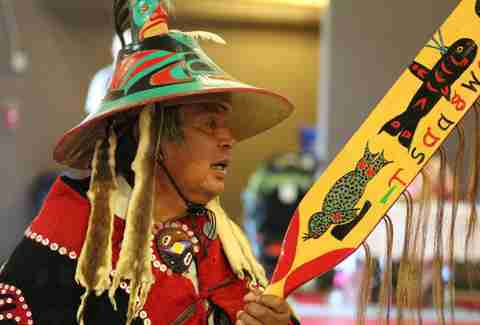 We spent the afternoon learning about their culture and lifestyle, and the story of the Tlingit people in Southeast Alaska. We were then treated to a performance by their traditional dance team, which, by my calculation, contained about half the population of Kake. Literally the entire city came out to the high school gym to welcome us and watch the dance. It's the kind of cultural immersion that's usually difficult to come by on a cruise, and one of the more memorable parts of this trip. 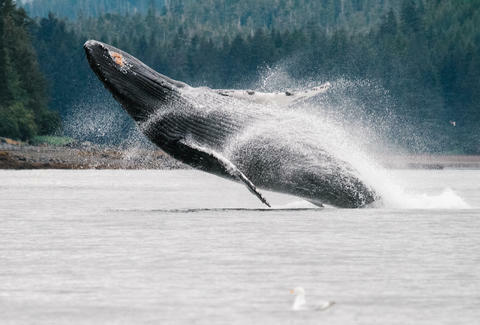 The first time you see a humpback spraying water out of his blowhole in the distance, it's a magical Alaskan experience you're furious you can't put in your Snap Story. By the end of the week, you'll be working out on the third deck's outdoor gym, see one, and think, "Will I ever again do a set of triceps extensions with a humpback whale playing 300 yards away from me? Maybe tomorrow." 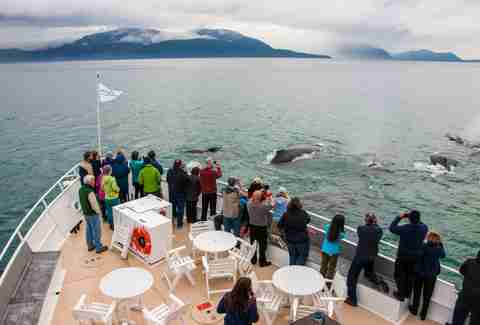 The highlight of the whale-watching came while cruising through Frederick Sound. Humpbacks surrounded the ship only a few feet away, as people scrambled from bow to stern to take photos. 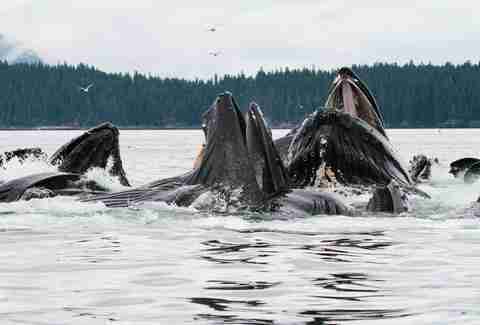 Two or three tails would go up at once, and after an hour it just seemed like we were part of the whale pod. 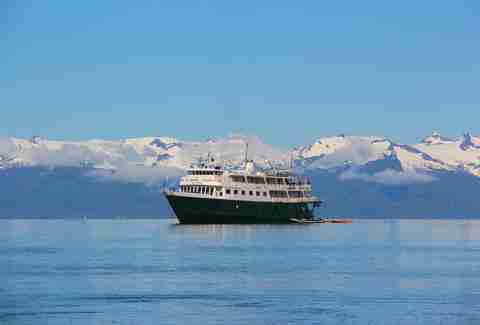 Alaskan snorkeling sounds about as logical as a Cleveland championship parade. But right about the time LeBron was crying on the Oracle Arena floor, I was wearing a 17mm wetsuit, decked out like a touristy Navy Seal, and back-rolling into 40-degree water with a snorkel in my mouth. 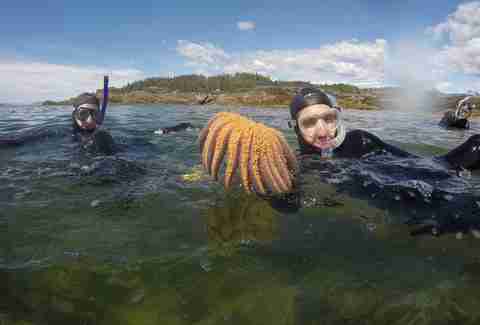 The undersea life in Alaska, while not exactly Turks and Caicos, is still a world unlike I'd ever seen, packed with starfish, sea cucumbers, and sunburst sea stars -- starfish with up to 20 legs. Yes, it's bracingly cold, but snorkeling here is a look into a part of the subarctic world even adventure tourists rarely glimpse. 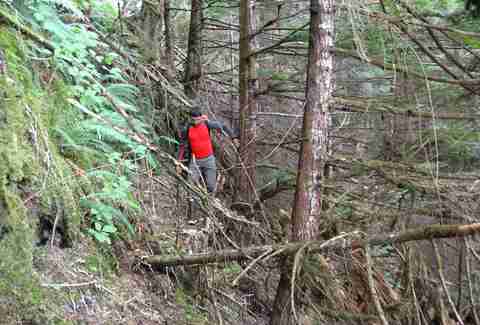 The "hikes" on this cruise aren't so much guided expeditions on trails, but bushwhacks on which your group clears a path through unmarked wilderness. Maybe you'll run into a bear. Maybe you'll scale a cliff. Maybe you'll discover a beach. These jaunts reminded me of being a little kid, back when kids were allowed to explore forests by themselves. Each day we spent three hours hopping up cliffs, breaking branches to clear paths, scaling fallen trees, and trampling through streams. We just acted like boys in the woods, and nobody told us to stop. Because the ship is so small, it's able to navigate though seas of icebergs, as we did at Tracy Arm. The icebergs are all strikingly blue, like the good meth from Breaking Bad, just much bigger and slightly less likely to kill you. Their shapes were cloud-like; when we stopped we were able to take kayaks and paddleboards through them to see if they really did look like giraffes and airplanes up close. After an evening with the icebergs we traveled on until our path was stopped by an imposing blue block set between two mountains. The North Dawes Glacier looked back at our tiny ship, and all 200ft of it said, "You go no further." While the glacier was impressive, the mountains around it were ice-free until about halfway up. 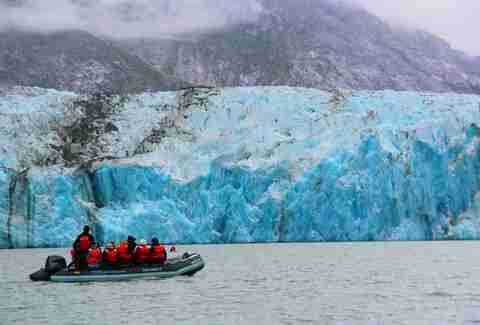 "That's where the glacier has melted away the past five years," our guide said. "That rock hasn't been exposed for 10,000 years." He was interrupted by a shotgun blast. 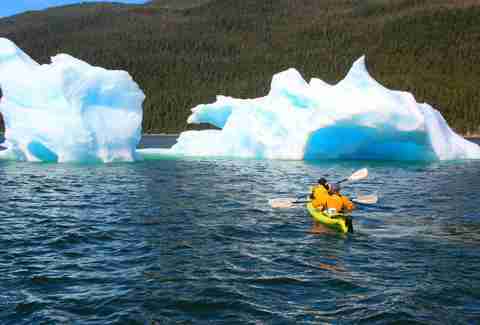 "That's the glacier calving," he said, referring to when parts of the glacier break off into the water. It's been more frequent in the past decade or so. With enough of these blasts, the once-mighty block of blue ice will just be drops in the Pacific Ocean. The week was an education. Not only in Alaska and its grand natural beauty, but in what it means to really be on vacation. With no cell service and no Wi-Fi, I was forced to get to know people on the ship beyond their Instagram posts. I took time to soak in the creations around me, and appreciate how they came to be. When we finally got to Juneau, my phone starting blowing up with a week's worth of text messages. Somehow they didn't seem so important. Matt Meltzer is a staff writer with Thrillist, and is happy to be back on the grid on Instagram: @meltrez1.